The final table at the PokerStars UKIPT Isle of Man has been set and it's one filled with former finalists and winners. Leading the way into today's finale is Josef Snejberg (1,561,000), followed by Josh Hart. 2011 UKIPT Edinburgh winner Fintan Gavin (1,148,000) lies in third with former UKIPT Marbella winner Ludovic Geilich in fourth. Local hopes will rest with 43-year-old former cardroom manager David Hill (1,029,000). The aforementioned Josh Hart's roommate, Marc Ragden (743,000) starts the final table in sixth with Ireland's Ciaran Heaney (589,000) and 2013 UKIPT London runner-up Thomas Ward rounding out the final eight. One man who can count himself unlucky not to be joining them is Martins Adeniya who was Sunday's very unfortunate bubble boy. The Full Tilt Ambassador looked in great shape for a big double when getting it all in pre flop with kings against David Hill's Js10s. The Isle of Man native flopped a 10 on the flop and a jack on the turn to take the pot and leave Adeniya with just a single 1,000 chip, which Ludovic Geillich scooped up a hand later. Others to fall by the wayside, but in the money, on the final day included Victoria Coren-Mitchell, Fatima Moreira de Melo (38th for £2,000), Simon Deadman (32nd) and, Adrienne Rowsome (12th). Darren Woods started the day with more than double the chips of his closest rival but action proved too hot for the chef who busted in 30th for £2,340. The final table action resumes at noon with each player guaranteed at least £8,000. The eventual winner will walk away with £65,900. 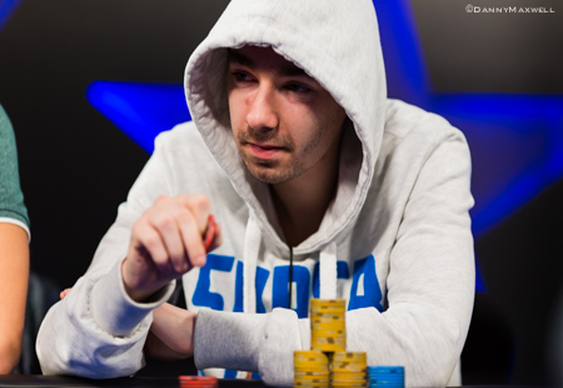 Image courtesy of Danny Maxwell @ PokerStars.